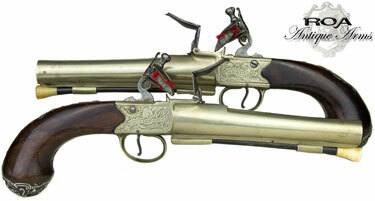 ROA Antique Arms are well established International Dealers and Specialists in Fine Antique Arms. Secure Online Purchasing, Excellent Customer Service & Worldwide Shipping through our European Office. If you would like to receive our monthly Newsletter with details of new additions to our collection please register on our website or register your email address at the top of this page. ""I've been dealing with 'ROA' for some time now and have always found your company to offer outstanding, quality pieces at superb prices. The photo's and descriptions are absolutely 100% accurate... What the customer sees and reads, is what the customer gets. Without exception ! ~It has been my great pleasure to be one of those customers..."
"There is nothing quite like a fine antique weapon to evoke feelings of nostalgia. To think of the skilled craftsmen who made it and for whom, where it has been and in which conflicts it may have played its part. Did it sail the high seas, defend a great nation in battle, or someone's honour at dawn? Not only is it an item of beauty and history but often one which has endured the tests of time against all odds. Just imagine what stories it could tell." Copyright (c) 2013 The Davies Partnership Ltd. All rights reserved. Design by FCT.